A very special stand alone issue probing deeply into the incredible life of Marten Broadcloak. We learn his deadly secret agenda and true goal is not to serve the Crimson King, but to climb to the top of the Dark Tower itself and become the overlord of all existence! 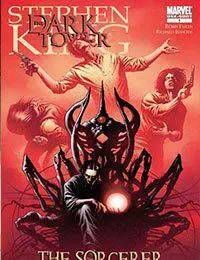 Written by Robin Furth, the guiding force behind the Dark Tower series and illustrated by Richard Isanove whose stunning coloring on Dark Tower has helped make every issue a work of art. This is an instant collectors item no Stephen King fan can afford to be without!